Courtesy of Rodeo Realty, Marc Tahler. 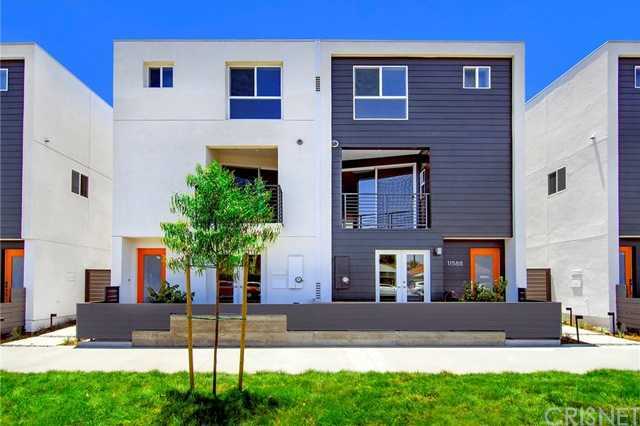 Newly built by WCH Communities, Gallery is a limited collection of new, single-family homes with contemporary architecture in a quiet residential Valley Village neighborhood just minutes from Universal City, NoHo and Burbank. This structurally-independent, three-story home features three en-suite bedrooms, 3.5 baths,an attached direct access two-car garage and private patio area. The second level is bright and open and includes a gourmet kitchen, dining area and great room with balcony. Modern amenities include custom cabinetry, Quartz countertops, stainless steel appliances, European Oak plank flooring and designer fixtures. The location offers easy access to the Metrolink Orange and Red Lines at the Chandler and Universal Stations and is ultra-accessible to the 101, 134 and 405 freeways. Stroll down the street for coffee and groceries or meet friends at one of the neighborhood hangouts right outside your front door. Don’t miss! Based on information from California Regional Multiple Listing Service, Inc. as of April 23, 2019 10:01 and/or other sources. All data, including all measurements and calculations of area, is obtained from various sources and has not been, and will not be, verified by broker or MLS. All information should be independently reviewed and verified for accuracy. Properties may or may not be listed by the office/agent presenting the information.